I’ve always been fascinated by salmon. In a certain way I envy them — well, troche that may be a stretch, pills as everything and their grandma wants to kill them, and at best (the odds are staggeringly against it) they get one squirt before they die. Kind of reminds me of the movie “Cold Mountain”— Jude Law is the salmon and Nicole Kidman is the redd he’s spent years dreaming of while wandering the chaos of the world. Envy isn’t the right word, but I admire the purpose-driven nature of a salmon’s life. They never anguish over the question “for what purpose do I grow?” Their purpose is in their blood, flesh and spawn. For many in Southeast and elsewhere, myself included, they are a big part of our food and livelihoods. While this year seems to be living up to the prediction of a lot of king salmon swimming in our waters, most are from hatcheries or the Lower 48. 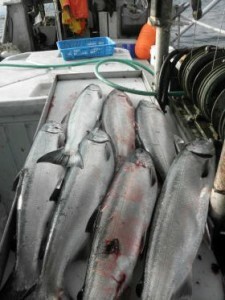 Wild kings’ numbers all over the state, including those in the great rivers like the Taku, Stikine and Unuk are diminishing. Many of us have heard of the massive wave of mining and petroleum development occurring in northwest British Columbia threatening the future of wild salmon. Northwest BC has been coined the “new wild west” and is being called the “next big gold-rush.” There will likely be negative affects for Southeast Alaska’s ecosystems and economy. A big concern is the amount of acid mine leakage that will flow into many major Southeast Alaskan salmon rivers, including the Taku, Stikine, Unuk and Nass. The potential for disaster is so probable with some of the projects — the proposed KSM mine on a tributary of the Unuk River is one example — that Alaskan Natives, biologists, fishermen and people who care about the future of BC and Southeast Alaska are more than worried. On May 14, I attended a talk by Wade Davis, an acclaimed author and National Geographic Explorer in Residence, about the “Sacred Headwaters” of the Stikine, Skeena and Nass rivers. The Tahltan people, who’ve lived in northwest BC for thousands of years, biologists, Davis and others have been fighting to keep fracking and mining from happening in the ecologically sensitive and culturally invaluable area. While I enjoyed and admired Davis’ lecture, I was most impressed by the Tlingit, Haida and Tahltan speakers at the event. KSM, located on a tributary of the Unuk River, is a prime example of a mine that has the potential to greatly compromise a region’s fishery. Annita McPhee, president of the Tahltan Central Council, stated there is “so much development” going on in her BC homeland — as many as 250 exploration permits at any given moment. While she’s not opposed to all projects, the development of the “Sacred Headwaters” is one that the Tahltan are united against. She introduced her elder, Mary Dennis who, along with several other Tahltan people, was arrested while peacefully protesting the Shell Oil Company. Recently, Shell withdrew its interests in the region, a testament that people like Mary Dennis, who stand up for what they believe, do have the power to stop big corporations. Now Dennis, McPhee, Davis and many others are trying to prevent a massive open pit coal mine from happening in the same area. McPhee promised to bring Peterson and other Southeast Alaskans’ message of opposition to the KSM mine back to Canada. The meeting of Tlingit, Haida and Tahltan leaders pledging to communicate and work together over the future of the transboundary region gives me hope for wild salmon. • Bjorn Dihle is a writer based out of Juneau. He can be reached at bjorndihle@yahoo.com.